For conservation cleaning and necessary repointing of two family memorials and six grave markers (details below). The Charles Pfizer Company, “Manufacturing Chemists,” was formed in Brooklyn in 1849. Their first plant was located on Bartlett and Harrison Streets, Williamsburg, then a predominantly German community. Charles Pfizer, Sr. (1824-1906) founded the company with his partner Charles F. Erhart. Both men were German born, and brought their scientific knowledge of chemistry to the United States, then in the great rush of an industrial revolution. From the early days of refining basic chemicals, the firm would evolve into the sophisticated international research and manufacturing corporation we know today as Pfizer Inc. The firm, which has its World Headquarters in New York City, still maintains important facilities in the Borough of Brooklyn. Charles Pfizer, his wife Anna, their eldest son Charles Jr., daughter Ann who died at one year old, and son Julius who survived to seven years old, and other family members, are interred in the original family plot near the center of Green- Wood. The site is across from the noteworthy “Twin Weeping Beeches” arching over Larch Avenue. The all-granite Classic Eclectic monument was erected in 1907 by the Harrison Granite Company of New York City and Barre, Vermont. 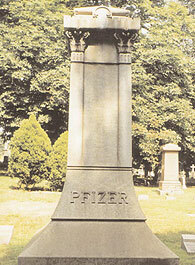 Approximately 15 feet in height, the fine-grained granite work consists of a base 6’-6” square, a molded shaft bearing the classical raised lettering of the name PFIZER. Engaged tapered pilasters, and the carved capstone ornamented with composite-style pilaster capitals, crenelated cornice and pyramidal top, provide refined detail to this elegant monument. Also located within the plot are six granite grave markers for family members, and one lot marker block inscribed in “V” cut lettering CHARLES PFIZER. The plot was originally surrounded by an enclosure, which was removed by the cemetery in 1947 with the consent of the Pfizer family. The Pfizer Family Memorial and headstones are all pink granite in whole and sound condition. Environmental soiling and biological growths mar the appearance of the elegant Classic Eclectic design of the monument. The family memorial and six grave markers require cleaning and repointing of mortar jointing to restore a dignified appearance. Emile Pfizer, who died at 75 years of age, was the last family member to serve as an executive of Pfizer Inc. He had never married and left no heirs to participate in the firm, which had evolved over time into a publicly held company, with employees owning significant interest in the business. The Emile Pfizer Memorial consists of an all light gray granite circular temple containing a built-in polished dark gray granite sarcophagus inscribed 1866 EMILE PFIZER 1941. The modern structure, which stands approximately 15 feet in height with a circumference of about 18 feet, is derived from a Greek tholos (a circular temple with a domed or open roof) styled in the Doric Order and open to the sky. It consists of three circular stepped platforms supporting the colonnade. The colonnade has four full round Doric columns forming the opening between two engaged square columns, and four pilasters defining the walled portions of the enclosure. The colonnade supports a simplified circular entablature, having a plain frieze bearing the incised block lettered legend: + TONGUES IN TREES BOOKS IN THE RUNNING BROOKS SERMONS IN STONES AND GOOD IN EVERY THING +. Within the interior of the temple (the naos) above the sarcophagus, there is a carved bas relief, winged female angel gesturing upwards. Emile’s brother and sister were later interred within the vault of the memorial, and the following inscriptions were added to the floor of the temple: GUSTAVE PFIZER 1861-1944, and (Baroness) ALICE BACHOFEN VON ECHT 1876-1959. The Pfizer monuments are in very sound and whole condition. They each require gentle detergent and water rinse cleaning to remove superficial soiling and stains, while carefully protecting carved details and the polished sarcophagus of the Emile Pfizer memorial. Missing and defective areas of mortar pointing, especially on the steps and top of the temple entablature, require replacement in mortar to match existing in composition, color and finish. The grade and turf directly in front of the Emile Pfizer memorial requires restoration in order to cover the exposed masonry foundation.